With a realistic fantasy-based setting that includes magic, dragons, and Zombie-like creatures, and almost everything in between, Game of Thrones has become a global phenomenon unlike anything else over its five season run. With its sixth season premiering on April 25th on OSN, conversations about the enchanting new season are set to dominate airspaces once again, especially after season five’s tantalisingly tense conclusion. In celebration of the show’s long awaited season premiere, eniGma’s Mahmoud Al Badry spoke with Jonathan Pryce, arguably last season’s biggest cast addition, to discuss what it’s like to act in Game of Thrones’ impressive universe, his character’s motivation, and what lies in store for season six. As an actor with nearly 50 years’ worth of experience under his belt, Pryce has been a part of variably contrasting sets throughout his career. Indeed, with an evident veteran’s composure and levelheadedness, one can’t help but get the feeling that he’s seen it all in his numerous film and TV projects throughout the years. 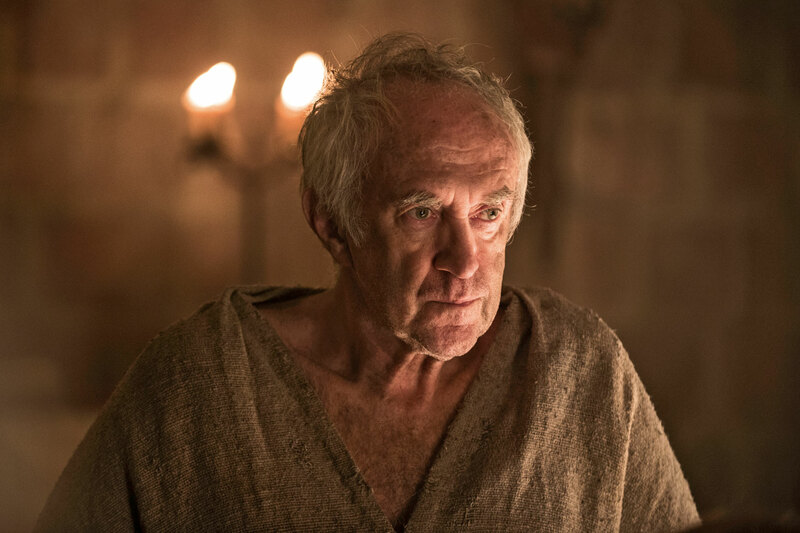 Playing a religious fanatic that is eerily similar to present day extremists throughout the world, Pryce relishes blurring the lines between good and evil in his portrayal of the ‘High Sparrow’ in Game of Thrones. Spoiler alert: this interview includes numerous references to Game of Thrones’ fifth season. How did you find working in the Great Sept of Baelor, a giant, 360 degree set? Your expectancy is some kind of shorthand; that you’re going to be against a green screen. To actually walk on a proper, massive set was fantastic; it elevates your status – even though my opening scene was me washing the steps of the sept. But at least they were my steps. How is it like to film in the frosty Irish weather whilst wearing a mere sackcloth in all of your scenes? And bare feet, don’t forget about the bare feet; that’s the worst bit really. Luckily, the lovely dresser would bring me a hot water bottle to put on my feet when I sat down. They film with three or four cameras and sometimes they’re miles away; you never quite know what’s in shot. Thus, I couldn’t get away with trying to wear shoes for warmth. The camera would be a mile away and you’d get, ‘Sorry Jon, we can see your feet’! I’d still keep trying to get away with it though. 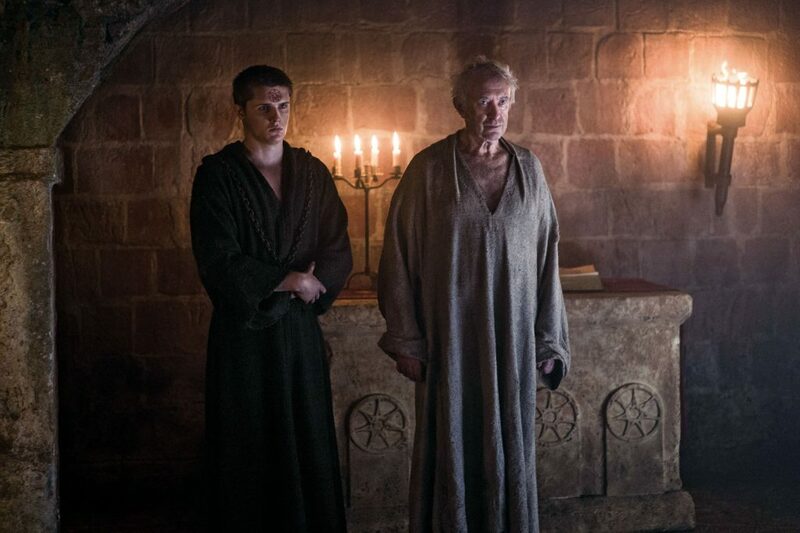 Set the scene for High Sparrow as we begin season six. Well we left him at the end of season five demanding that Cersei take the walk of shame, and that’s the last image you saw of him. That’s great because it leaves you wanting answers to the questions of where does Cersei go next, where does High Sparrow go next? Is she going to have to undergo further degradation and abuses? Is she going to have to have more punishments? It’s obviously not going to end there for her. And also, Queen Margaery is in jail. What’s going to happen to her? Is she going to have to face the same humiliation? And how does King Tommen relate to all this? So it’s a great place to begin season six in. I finished season five as an actor, not knowing what was going to happen next. So that was a very interesting place to be. And then, coming to read through season six, I just couldn’t believe the direction that the High Sparrow storyline was taking. Will we learn more about High Sparrow’s background this season? You will discover more about High Sparrow, where he came from, what drew him to this faith. It was all with good intentions; he had lived a very debauched life, he was very rich, then he woke up one morning and said, ‘this is wrong’ and walked out with bare feet. He has stayed bare-footed ever since. I remember coming to the character early on and it was at the same time, more or less, as Pope Francis had been elected. And there was Pope Francis doing everything that High Sparrow had been doing, apart from the bare feet: talking, administering, and protecting the poor. The intentions are good. But then, the fundamentalist side of the faith begins to take over: the punishments, the brutality, the army, as well as this desire to take over the known world, as it were. At the heart of everything for him, is the belief that ‘we are the many, and you are the few’, so to speak. He’s not close to thinking that what he’s doing is maybe too extreme or wrong; he thinks he’s still on that path of righteousness. Can you tell us about how your storyline climaxes this season? The most intense scene in my opinion is when everyone is waiting for Cersei to come to her trial, which is to be held in the Sept. And of course, I’ve taken my eye off the ball in that I had thought she’s bound to come, though I’m told she hasn’t left the house. In the meantime, all these plots and machinations are taking place throughout King’s Landing. The tension should be palpable as, while people are gathering in the massive sept, very content and assuming all is going well, there’s a huge surprise brewing for all of them. There are some villains in Game of Thrones who are intrinsically sinister and others who do similar misdeeds for perceived necessities. Where would you place the High Sparrow on that spectrum? Well I’ve got to see him as good and I find it very hard to be objective about him. I’ve always found it difficult to be anything but subjective when playing any character, as I always want to believe whole-heartedly in whatever my character is doing. Notwithstanding, my opinion of the High Sparrow is that he’s not necessarily thinking ahead and continuously plotting, or at least, that’s an aspect that he’s certainly not showing to the audience. While he’s still being referred to as a bad character, I remain hopeful that he can seduce the audience in addition to his vigorous attempts at seducing Margaery and Tommen into the faith. How would you summarise his motivations, then? I think he hates anyone of the ruling class. That’s his motivation really: revolution.